On LSAT Logic Games, speed is more important than on any other section. 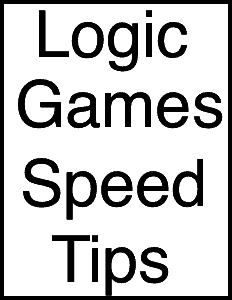 There are specific ways you can improve your speed on logic games, whereas on logical reasoning and reading comprehension, speed tends to depend almost entirely on how well you understand the material. The key to speed on logic games is how and where you draw your diagrams. This is easiest to show in person, but I’m going to do my best here. From preptest 66 onwards, you have two pages to use for logic games diagrams. This seems like a good thing, but it’s a trap. 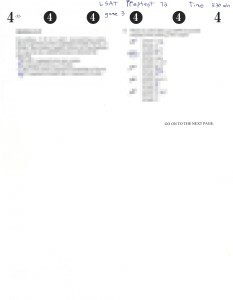 Do not use the first page. Instead, your diagrams should be as close to the questions as possible. This reduces eye scanning distance. Looking from one page to another is an easy way to distract yourself and lose everything you’ve been working on. Logic games are hard. You have to do an elaborate chain of deductions in your head. If you are even slightly distracted, the whole chain of deductions falls apart. Distraction causes you to go slower and make mistakes. This is not a hypothetical risk. I’ve watched students do logic games in person. I see their eyes go back and forth between questions and far off diagrams. They make the same deductions over, and over, and over, not even realizing they’re forgetting deductions and repeating their work. Large eye scanning distances are disastrous. Experts use only the second page. Why would you do things any differently? For more detail, see Jeffort’s excellent reply on this Top Law School thread. He’s replying to a comment I made describing my diagramming method. Diagrams go on page 2. Click for a large view. Notice that I’ve drawn nothing on the first page. That’s because it’s far away from the questions. Instead, my main diagram is just below the questions. It’s cleanly drawn, so I can instantly find it, with no confusion. My main diagram stays clean. I can refer to it to see the rules, with no confusion. The diagrams for each question are right beside the answers. There’s zero delay between looking at the deductions I’ve drawn and the answers. Practice with this method a few times. You’ll notice the speed difference once you get used to it. Look closely at my diagrams. They are not large. This is how I draw all my logic games diagrams. If you practice making small diagrams, you’ll find they’re just as easy to understand as large diagrams. Small diagrams are much better than large ones. They’re very quick to draw. And you can place a small diagram in a small space near the question. Having a diagram near the question offers a massive speed advantage. Notice that the diagrams I drew on my page above don’t have many details. You should try to reduce details down to the bare minimum. Extra details increase the difficulty of reading your diagrams, and they take longer to draw. The diagrams I make for my explanations are fairly simple. But the diagrams I draw myself on my own paper are even simpler. I keep additional details on my online drawings so they’re clear for you to read, but for my own purposes I trim diagrams down even further. Here is one of my online diagrams for PT 72 (game 2). I’ve also uploaded what my own hand drawn diagrams for that game looks like. Notice that I didn’t number the spaces. It’s a small difference, but it makes the diagram faster to draw, and smaller. At first, you’ll find it confusing to read the diagram without numbers. But if you do games like this a few times without numbers, you’ll find you can instantly see which spot is 4th, 2nd, etc. What’s the advantage of small diagrams beside the questions? First, I find my version cleaner. There’s more white space. I can scan the diagram faster. Also notice that “Q, S” requires two letters, while “Q/S S/Q” requires four letters. So my version is faster to draw and produces less visual clutter. On its own, using “Q, S” is a small change. And removing the numbers is a small change. But my diagrams have dozens of small changes like this, and these add up to a massive speed advantage. Search for small optimizations everywhere. Constantly simplify your diagrams. You’ll go much faster for it. Of all my speed tips, this is the most important. Memorize the rules. On logic games, you’re meant to solve the questions the way a computer would. And computers don’t forget the bloody rules! When I suggest this to students, the usual response is “I caaaaan’t memorize the rules! It’s hard!!”. But then I ask the student if they had ever practiced memorizing rules. “Well, no….” is the usual answer. I read the rules once to understand the game. A third time: to check for mistakes and look for deductions. I would do all of this even if I wasn’t trying to memorize the rules. This four step method is the best way I know of reducing mistakes, getting the best setup, and going fast. The first read makes your setup more efficient. Most people just start drawing as soon as they read the first line of the setup. But if you haven’t read the whole game, how do you know what to draw? The second read it obvious, that’s just to draw the diagrams. The third read, error-checking, is a step a lot of students mistakenly skip. A single LG error can cost you 3-5 minutes and make you lose 2-7 points. That’s a horrifying risk. Just read the damn rules one more time to check. You’ve got time to double check the rules….and double-checking will save you time. You’ll also find deductions while doing this step. The extra 10-20 seconds is worth it. If you notice even one deduction, that can shave minutes off your game time. Finally, the fourth read is simply the most efficient way to solve the first question, which is usually an acceptable order question. All four readings of the rules make sense on their own. But a massively beneficial side effect is that you will effortlessly memorize the rules if you follow the method above. Try this method, and time yourself. I guarantee you won’t take much longer on the setup, if you even do take longer. Like anything else, you can get better at memorizing the rules if you practice. Here’s how to do it. Print two copies of a game. Give one copy to a friend. Go through the four readings I described above, and draw your main setup. Then turn over your sheet. Try to list all the rules for your friend. The first step on this drill is merely succeeding at memorizing the rules. If you can’t do that, then repeat this exercise with new games until you can routinely memorize the rules. The next step is learn to memorize the rules fast. Time how long it takes you, and keep trying to go faster (faster on average; games are different). You will get good at this if you practice. Games are about combining rules to make deductions. If you don’t know the rules, you can’t combine them. Whereas, if you know all the rules by heart, then a lot of “tricky” deductions become obvious. Logic games ask you to be like a computer. And computers…don’t….forget….the rules! If you want to think like a computer, then at minimum you need to know the rules. And if you know the rules, you’ve already done 70% of what’s required to do logic games fast. Thank you Graeme! The way you drew interchangeable Q/S is clever. However, if there are another two floaters and another two blanks, you will draw it just like how you draw Q/S. And won’t it be confusing and you forget which is interchangeable which is free floaters. It’s context dependent. In some situations I would draw Q/S. For example if the blanks were far apart, or if there were two sets of floaters. The idea is that if you repeat games and practice your diagrams, you’ll develop an intuition for this sort of thing and there’s no risk of confusion. Like how you don’t mix up there and their when writing, even though there’s potential for confusion. How do you recommend we repeat games if we don’t use scratch paper? Should we erase after solving the game so we can solve again later. I want to use the test but am hesitant because i’d like to go through the game again. Unfortunately a bit hard now. People used to use PDFs, but LSAC banned those. You can make photocopies of the games, and practice LG using only those. I think the best solution I’ve found is to buy the hard copy of the test from LSAC then scan it in to PDF form and storing it on your computer. This allows for printing of multiple copies when needed. I am really struggling with Logic Games. I’ve got the Logical Reasoning section down pretty good but honestly, when I get to the games I get so frustrated I cant even think clearly on them. I have tried diagramming and I tend to get the first question correct on ordering and then once I read the questions that say “if….. then, which of the following must be true?” my mind wanders and I can never even come up with the answer. Any tips on staying focused at the task at hand to quickly and accurately figure it out? Meditation? It’s basically practice for focussing. Also, draw the new rule (the “if”, which is a new rule). Focussing on what’s concrete prevents your mind from wandering. I am taking the kaplan course and your method is very different. i have to say though, logic games is the section i am struggling with the most, that is why i branched out to find new ways and this seems like it may work better for me. kaplan does say to make the rules as your reading, as you say to read the rules all at once and then make your diagram. Why do you think this helps so much? How much time should we be spending on each full LG question since we are reading 4 times? Is this your method for all LG types of questions? I don’t know how much time to spend. It varies by game, and also how long it takes you to fully internalize everything. I can say I spend relatively more time on the setup, but then move quickly through the game. I think reading all the rules and THEN drawing one by one lets you see the whole but also focus on one rule and once and draw them efficiently and accurately. I’m a convert from Kaplan with only a couple of their bad habits left. I sometimes feel like they’re over complicating things deliberately, to make it seem important to memorize their dozens of situational strategies. Seriously, 4 game types?! Definitely go with Graeme, and he’s not paying me. I think with the Kaplan timing dictates you probably lose twenty or thirty seconds checking your watch several times, not to mention how nervous it makes you, to decide whether you’ve spend enough time on the setup. Just do the setup, and get fast at it with practice! Under Memorize the Rules: “The first read makes your setup more efficient. Most people just start drawing as soon as they read the first line of the setup.” “Setup” is ambiguous in that sentence. No reply expected; deleting this reply is OK.
Oops, also the headline: “How to faster…” — “go” is omitted. This is a useful article! I’ve noticed that sometimes I overlook a crucial detail in the scenario, the part that precedes the list of conditions. In this article I assume that what is read four times and memorized and referred to as “the rules” is the list of conditions, not including the initial scenario. Wow! Memorizing the rules is not something that I had heard of or even thought of, but it makes sooo much sense for a better understanding of the game, which in turn produces faster results! Thank you so much for your insight! Hi Graeme! First of all, I want to say thanks so much for your website. The solutions to the prep tests have been an invaluable resource for me. I have improved a lot on Logic Games since learning the strategies, but I find that I still really struggle with time. I am good at diagramming. I can usually create a correct diagram and go through the rules / deductions in about 2-3 minutes (usually matching the diagrams on your solutions very closely). My problem is when I get to the questions, I can’t go fast enough. Some questions take me 2-3 minutes. I usually finish a section with very few mistakes, but it can take me 10-12 minutes per game. Any tips on how to go through the actual questions faster? Thanks! The best way to improve your times on logic games is a lot of practice. Repeat games that you’ve done before multiple times — and each time, attempt to complete the game faster. What this will do is help you see the deductions necessary for answering questions more quickly. Another thing to analyze is questions where you seem to be sinking a lot of your time. Are you spending more time on questions than you need to? (e.g. making unnecessary deductions or drawing out gameboards in full when you only need to draw out part of the gameboard) Also, are there certain types of questions that seem to be giving you the most difficulty? Practice those kinds of questions as many times as you can. I challenge anyone to do an INDEPENDENTLY generated LSAT question set in the time allotted. Or do LSAT questions come only from the LSAC?